Retraces the 1853 journey of Theodore Winthrop through Washington, Oregon, and British Columbia, offering a narrative of a land caught between conservations and development and its people. 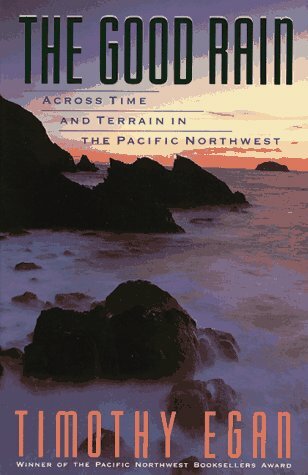 As a Northwest native, and longtime resident of Puyallup, I found Egan's book, published in 1990 an engaging read, and somewhat prophetic about the effects of the continued growth and development of the Puget Sound region-both in the wild and not-so-wild wild places. Egan's first book is a highly informative - and fairly opinionated - look at Pacific Northwest history, politics, and ecology. *The Good Rain* would serve as an excellent introduction to anyone new to the region or simply interested in learning about this part of the country. In this book, Timothy Egan travels around the Pacific Northwest and give the reader a sense of its natural, environmental, and modern history. He (sort of) follows the footsteps of Theodore Winthrop who explored the area in 1853. He compares what Winthrop saw, and what Winthrop predicted for the area, to what Egan saw in 1990. I have lived in the Northwest for over 30 years and have traveled around quite a bit, but this book was full of interesting things that I did not know. It even gave me one or two new places I need to visit. Egan manages to fit quite a bit into a small volume. His observations make you think a lot about some of the trade-offs we've made - sometimes out of good but ignorant intentions and sometimes out of carelessness. Obviously there is no excuse for our treatment of the native tribes. But sometimes the things we did that have negatively impacted the environment have been for good reasons - damns that brought electricity to farmers in eastern Washington, for example. While Egan has an obvious bent toward leaving things as they were, he also presents the other side of the argument. The book will be much more interesting to those who live in or have visited the Northwest. But it might just spur an interest in one who has not been here before. This book is one of the most depressing books I've read in a long time. In this book Egan set out to follow in the footsteps of Theodore Winthrop, a 19th century American writer and traveller, who wrote a deailed book about his travels around the Pacific Northwest of the North American continent. Egan talks about the differences he found 137 years after Winthrop wrote his book. And as I said at the start it's very depressing. The sheer amount of damage and devestation caused by man is horrendous. Forests and rivers that had lasted thousands and thousands of years were destroyed within decades. Mankinds insatiable greed and stupidity has butchered so much that is irreplaceable. But there is hope, though this book doesn't show much. Written 20 years ago environmentalists back then were seen as druggies and hippies, people on the fringe. Since that time environmental awareness has grown throughout the world. It's still nowhere near good but it's the most aware Western civilization has been for an extremely long time.